Projects can be recognized, procured and initiated in a variety of ways. Some are birthed in-house and stem from an opportunity the organization identified for itself, an opportunity that might be exploited for profit or other gains. Other projects originate outside the company, where the project team is merely the facilitator for stakeholders who employ them for their expertise, experience and specialized tools. These types of projects are often won through a bidding process that involves various entities vying for the work. Contract bidding can prove a lucrative track, but the bidding process can feel byzantine to those ignorant of its structure and process. Fortunately, like any project, it has a start and an end, and an understanding of the route between those two points starts by following these steps. Contracts can range from government work, which require a request for proposal (RFP), to long-term contract work as provider for a product or service to a larger conglomerate. Regardless of the type of contract, though, the steps towards bidding for that contract are relatively the same. Before you can bid, you must do the due diligence. That means finding the project that fits your company’s qualifications. You should only bid on projects in fields where you have extensive experience and have already proven your skill. Contract bidding is a competitive sport and the spoils go to the organization that has the best players, strategy and record. You can look at your business plan as a resource, and if the project aligns with your company, then you should start working on a plan. That plan must include why your business is the one to best take on the project, so do research on the company you’re bidding on. Use all the information you can to structure your bid to meet their various requirements. Once you’ve done the research and have a tentative plan in place to show how your company is right for the project, you now must customize your business plan to show how you can fulfill the bid request. Of course, you must consider the costs of materials, time and labor, but never under bid for the job. While you might think that whoever reads your bid will skim the details and only look at the bottom line, it’s simply not true. In other words, whoever offers the lowest bid for the project doesn’t always win. Smart companies know better than to base their decision solely on cost. If there is someone willing to do the same job for substantially less than you, that should be a red flag. That low-bidding contract is likely cutting corners or is submitted by a company willing to not make a profit. The bid can be submitted in any number of ways. Governmental agencies usually have an online portal where you can upload your bill for consideration. If so, make sure you know how the platform works and that the submission goes through correctly. You don’t want to make any last-minute mistakes and lose all that work or need to call and look silly. However, private sector bids might not require bids to be delivered online. Of course, digital delivery is becoming the standard, and many if not most companies will expect your bid to be delivered to a cloud server or some other digital deposit for large files. Digital files are easily distributed, but always check the submission requirements because some stakeholders might prefer hard copies. Follow the rules. You did the research; you submitted the bid, and now you’re invited to meet with the company. Congratulations, you’ve cleared one hurdle, but you’ve not crossed the finish line yet! You’ll be invited to present your pitch and meet the people you’re hoping to work for. This, like submitting the bid, can be done in more than one way. While it’s traditional to meet, and most companies still prefer the personal touch, you might have to present online through some video-conferencing application. Perhaps the company is located far away, or maybe they’re very busy and they just like keeping everything digital. Just be prepared to do your best, no matter where the meeting is being held. Regardless of where, the most important thing is making sure that you’re prepared for whatever questions you’ll be asked, and you’ll be asked a lot of questions. You will also likely find yourself negotiating the price of the bid, so be prepared to have a counteroffer or to hold firm. Remember, you can negotiate too. If the bid price is a deal-breaker, then have quality, labor or some other factor of your bid ready to adjust. As the bidding process comes to a close, know when the company is making their final decision. If you got it, great, you know sooner than later. But if they pass on your bid, then you want to know when that happens, so you don’t expend any extra time or energy on a lost prospect. And if they pick your company… you’ve got the contract! Finally, you can rest. Just kidding, now the work begins. You’ll want to know when the contract will be awarded, so you’ll have all your ducks in a row and are not taken by surprise. Chances are, the company will want you to start immediately. Not that the awarding company will expect you to hit the ground running when they say go, but you’ll want to begin the communications so that you’re always on the same page and that work is being scheduled how they want. The better you handle the transition from bidding to contracting the work, the more likely you’ll have a long relationship with the organization and be sought out for further projects. The terms bid, tender and proposal might seem like synonyms, but depending on the company they can mean very different things. It’s important to know what these definitions are before starting any contract bid. A bid is often used to get new business or repeat business. Therefore, a bid will be a joint effort from members of the organization of various levels of authority. A bid will usually be handled by a bid manager, who interacts with experts from technical to legal issues. Bid is also the term used when documenting an offer submitted in response to a request or invitation to tender. Tender can be used in place of bid, while meaning basically the same thing. 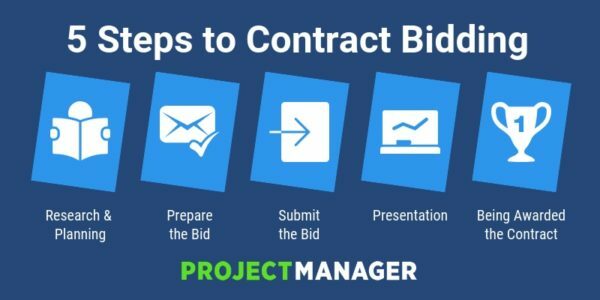 Mostly, the term bid is used by the organization seeking the project, while the term tender is more often used by the organization seeking the contract. Just as there is a bid manager, there is also a position for the tender manager. A project manager can often do this work as well. A proposal is a written document, drafted by the seller to a prospected buyer. It is one step in a more complicated sales process. Proposals tend to be more client-based and are highly tailored with solutions to the buyer’s requirements. They are created by a proposal writer who writes to the client’s or buyer’s needs. They can use the help of a technical specialist, who is not selling as much as focusing on design and functionality. If the work is very complex, a technical writer might be employed to more expertly and clearly address the technical aspects of the proposal. Creating a contract bid is a project, and then, if you get the contract, another project begins. That’s a lot of projects, with the need for detailed scheduling and accurate data. ProjectManager.com is a cloud-based project management software that has the tools you need to submit a winning proposal and then run a successful project. See how it can help you get more work and manage it more effectively by taking this free 30-day trial.